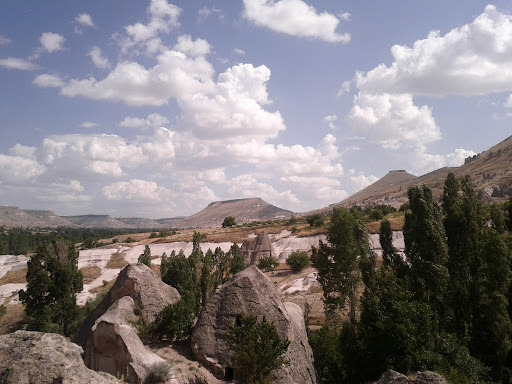 'Amazing, Awesome and Beautiful' are just some of the words my friends have expressed to describe Cappadocia. Today, we spent about 8 hours on a sightseeing tour of the area, which included a bit of hiking in this hot weather. I felt a little faint at times, so we plan to start our own hike of the Rose Valley earlier tomorrow. I will post more photos when we return to Istanbul. Handmade doll for my niece - 5 TL. Sharing a bottle of local white wine while sitting outside of our hotel room - 30 TL. Guided tour from a Turkish man who grew up in the area and knows the history - 90 TL. Ending the day covered head to toe in tiny bubbles in the hamam - priceless. Sounds wonderful! I am so glad that you all are having a great time!